Please Help us get a name and call to all these faces. If you see an error, or can identify anyone marked ?? ?, please contact with your correction(s). 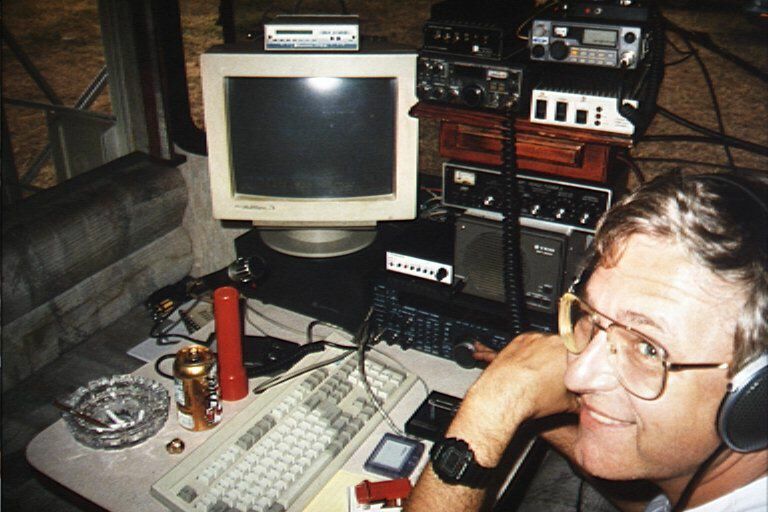 A view of the 15 meter operation from the eleven meter shack operated by Wouff Hong and Reddi Snitch. 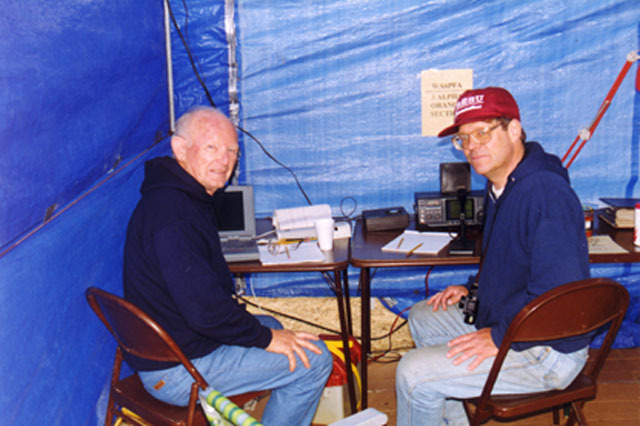 Chris, KJ6ZH, operating the luxurious 20 meter and satellite station. 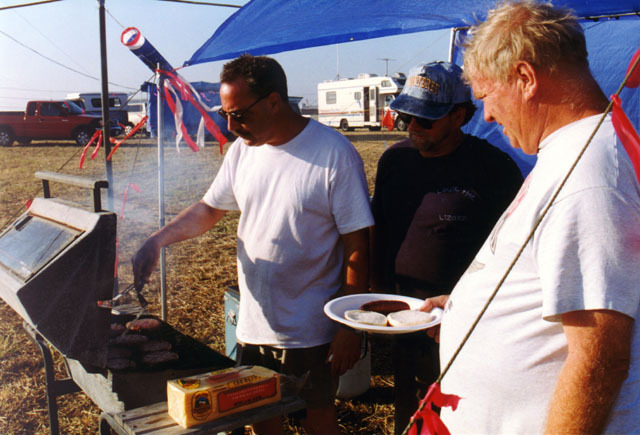 The hot dog and hamburger line. (L to R) Bob, KD6BWH; Larry, K6VDP; Paul, WD6FMX (seated); and Tom, WA6PFA. Head chef Frank, WA6VKZ cooks eggs and biscuit gravy for breakfast. Saturday evening chow time at Field Day. (L to R) Jane, KC6TAM; Roy, W5RT; Phil, N7PA; Jack, K6VGS; Larry, KR6LO and Ray, W6NT. 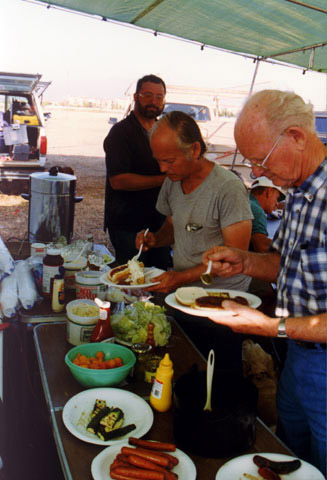 Our three supreme chefs; one working and two supervising: (L to R) Bob, KM6TL; Steve,KE6NAH; and Frank, WA6VKZ. 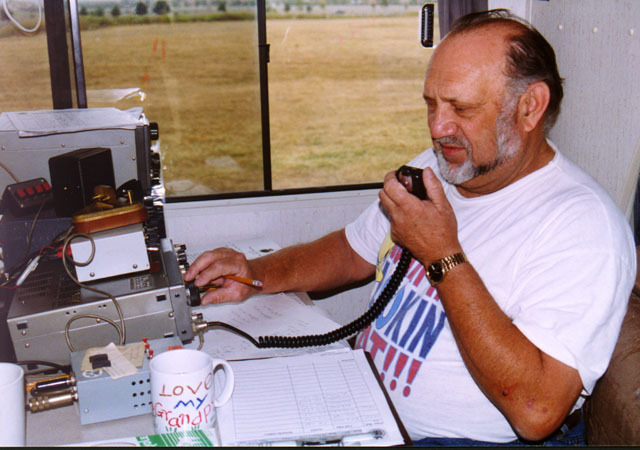 The 40 meter operating station with Larry, K6LDC at the mike. The Novice-Technician station with (L to R) chief-op Tom, WA6PFA and Bob, AF6C. 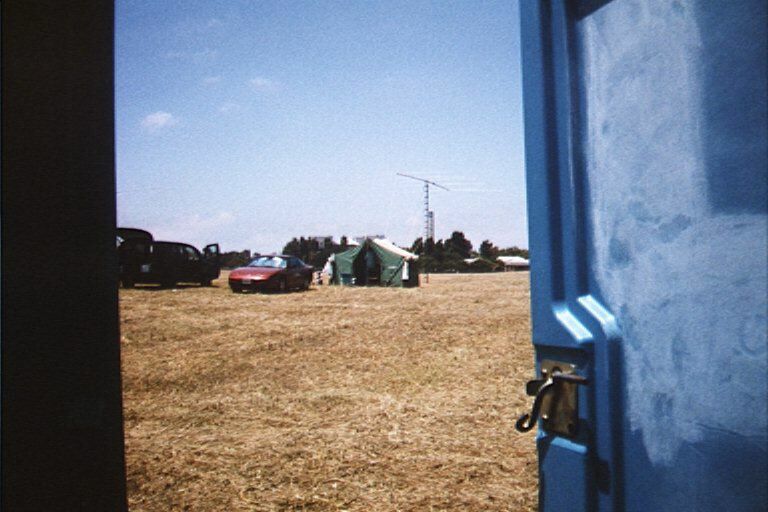 1998 Field Day is over and the Sunday teardown is nearly complete. Here's the crew who stayed to the end. Kneeling in front (L to R): Ken, W6HHC; Bob, KD6XO; Bud, WA6VPP; Bob, KD6BWH; Chris, K6KWH; Tom, WA6PFA; Cory, KE6WIU; and Larry, K6VDP. 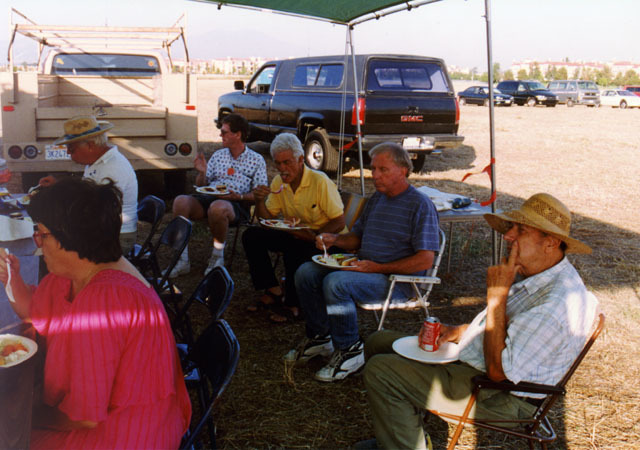 Standing (L to R): Chris, KJ6ZH; Jack, K6VGS; Jane, KC6TAM; Lowell, KQ6JD; Bob, AF6C; ??? ; Larry, K6LDC; Bob, KM6TL; Paul, WD6FMX; Frank, WA6VKZ; Suzie, KA6QVU; and Steve, KE6NAH.